If President Trump is the good cop when it comes to the U.S. government’s interaction with Boeing, Air Force Secretary Heather Wilson is the bad cop. 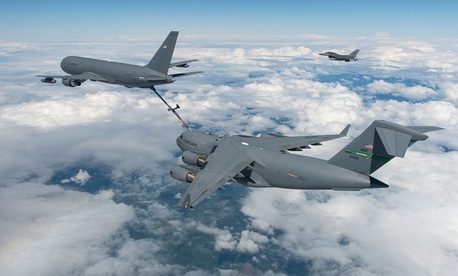 Annoyed that the Chicago-based firm has yet to deliver any KC-46 tanker planes to the Air Force, Wilson accused the firm of paying too much attention to its civil-aviation business and signaled that the Pentagon will charge Boeing for the latest delay. “[O]ne of our frustrations with Boeing is that they’re much more focused on their commercial activity than they are on getting this right for the Air Force and getting these airplanes to the Air Force,” Wilson told the House Armed Services Committee on Tuesday. That “message” — as Wilson called it — was delivered to Boeing leaders last week by Air Force Undersecretary Matthew Donovan, who traveled to Washington State for face-to-face meetings with with executives in charge of the multibillion-dollar tanker project. Boeing builds the KC-46 in Everett, a Seattle suburb. “We have asked them to put their A-team on this to get the problems fixed and get the aircraft to the Air Force,” Wilson said. Of Boeing’s $93 billion in 2017 revenue, its Commercial Airplanes division contributed $56.7 billion, more than twice the $21 billion for Defense, Space & Security and four times the $14.6 billion made by Global Services division. The KC-46 is a refueling version of the commercial 767, a plane Boeing has been making since the 1980s. The effort to equip the airframe for air-to-air refueling has been tougher than the company expected, and its contract with the Air Force has forced Boeing to eat about $3 billion in pre-tax charges. The latest problems are two “critical deficiencies” involving the “remote vision system” used to guide the refueling boom into an aircraft and a “drogue disconnect” issue involving the hose refueling system used primarily to refuel Navy and Marine Corps aircraft. The latest problems were first reported by Aviation Week. Boeing was supposed to deliver its first KC-46 tankers last year. It didn’t. The firm is contractually obligated to deliver 18 planes to the Air Force by October or face penalties. “Boeing has been overly optimistic in all of their schedule reports,” Wilson told lawmakers on Tuesday. Since taking office last year, Trump has visited two Boeing factories, the most recent being a defense hub in St. Louis. Boeing CEO Dennis Muilenburg has visited Trump’s club at Mar-A-Lago and was most recently at the White House last month for discussions about the price of a new Air Force One presidential aircraft. The airplane maker’s stock has hit record highs during Trump’s presidency.